Years ago, back in my adjunct days, I picked up a copy of Neil Gaiman’s short story collection, Smoke and Mirrors, to read on the bus as I shuttled between campuses. This was early in the semester, with no papers to grade yet, so that time on the bus was temporarily mine. It’s a very diverse collection of stories, including fantasy, horror, stories that read a little bit like fantasy and a little bit like personal anecdote, and even some poetry. Some were whimsical, some were serious, and some were just odd. 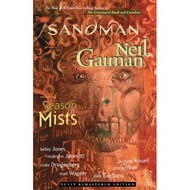 I liked some of them better than others, but on the whole, I enjoyed the collection very much, and over the years, I kept coming back to Gaiman, until I’d read all his novels and both his short story collections. He still has quite a bit of other work I haven’t read, of course,* and, delightfully, he keeps writing more, but the major thing I hadn’t read was Sandman. I don’t read graphic novels, or I hadn’t. It’s not that I had anything against them; actually, I’m all for the proliferation of different media in which stories can be told. I just hadn’t read any, and I found them a little intimidating. A lot of people say the opposite, but I’m an extremely text-oriented person. Example: it was only about five years ago that I realized I should pay attention to what movies look like instead of just converting their dialogue into a script in my head and reading it. So it didn’t seem like graphic novels would be a good match for me. But I was interested in reading Sandman, and eventually succeeded in receiving Preludes and Nocturnes as a gift. I was a little surprised how much I liked it, but still it took me a while to get the next three volumes in the series. I finally did, though, and a few days ago, I finished reading up to this point. I must admit that I feel terribly greedy when it comes to these books. I just want to take them away with me into a corner and consume them, page by page, like persimmon cookies. And then, possibly, I want to do it again. It’s that kind of addictive. Additionally, at this point, I should probably stop pretending that I am too sophisticated a reader for this to happen to me. Heh. It’s a great thing, really—after all, sophistication has its price. In any case, I stopped when I’d read all the books that I had, and on the whole, I think that’s a good thing. I’ll leave the rest for a while, so that I retain this feeling that there’s more and I can dip back into it when I get a chance. He is not pleased… Imagine a parent, or a cop, waiting for you to come home. …and that was, actually, exactly what I’d thought when I saw it. So, there, I can read graphic novels. I love how, when I began to form objections or questions, they are answered, as if they’d already been there and were only waiting for me to notice them. I wondered, throughout much of Dream Country, why Dream would help Calliope and not Nada—and at the beginning of Seasons of Mists, Death and Desire bring this up with him. I love how much of it is little allusions to everything in the world. I certainly don’t get all the references. I’m not a comics fan (as one might have guessed from my comments above! ), so I don’t know a thing about John Constantine. Similarly, the Chesterton references went over my head (should I do something about this?). But then there’s the use of Shakespeare, there’s the invocation of Milton for the Hell storyline, there’s Calliope and the little reference to Orpheus and so on. And then there’s the fact that Dream looks oddly like Robert Smith of the Cure—at least, sometimes he does. I love the character of Dream and the fact that, although he’s mostly sympathetic, we don’t entirely approve of him. He’s clever and serious and usually just. When he shows up, it is very often at a moment in which we will be pleased to see horrible characters get their comeuppance. At the same time, he is vengeful, perhaps too vengeful, and the things he does to people worry us. Really, I felt no sympathy for Ric Madoc, but what happens to him is disturbing enough that I was relieved when Calliope called a halt to it. I am still concerned about Alexander Burgess, much as he may have deserved his fate. Dream is also a world-class sulker and terribly impressed with himself. Sometimes we are impressed with him, too. Sometimes not. When Dream tells him what she thinks of his behavior over Nada, I was tempted to be charmed by Dream’s gallantry, and by how quick he is to take her seriously. At the same time, I was exasperated by his need to be told this, ten thousand years later. You know things have gotten weird when Death needs to wear running shoes. *For instance, did you know he wrote an episode of Babylon 5? I didn’t, until I saw it! It was just like a Neil Gaiman short story! **That is, for me, my right hand is the dominant one, so things that require this sort of perspective shift are like using my left hand. If you are left-handed, then right-handed would be a better term for this feeling. If you’re ambidextrous, then I’d need a different analogy.